to buy coconuts to sell and to buy a cooler. Keimy Jeanette benötigte 500 US-Dollar, um ein Gewerbe im Bereich Nahrungsmittel auf- oder auszubauen. Das Geld wurde gesammelt und für Keimy Jeanette bereitgestellt. Keimy, 19, completed high school. She is single and lives with her parents. 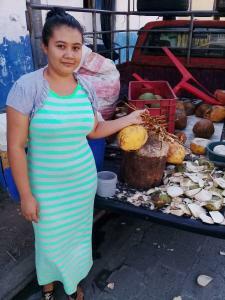 Keimy sells coconuts in the town center of the city she lives in. She started this business two years ago with her parents' help. She sells from 8 a.m. to 4 p.m.
Keimy will use the loan to buy coconuts to sell and to buy a cooler. She dreams of having more income to pay for college tuition so she can have a professional career.